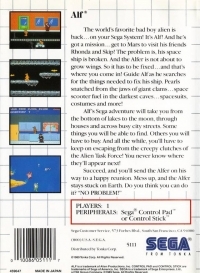 Description: Help ALF try to get to Mars to see his friends Skip and Rhonda! ALF's latest adventure takes him out of the Tanner household and into suburbia, the depths of subterranean caves, the bottom of the lake, and even the moon! As ALF looks for parts to build his space scooter, he is continually hounded by the ATF (Alien Task Force) who will stop at nothing to keep ALF from reaching his goal. However, ALF is not completely defenseless, as he can buy and trade for items that will keep him out of sight and away from their clutches. Box Text: The world's favorite bad boy alien is back... on your Sega System! Its Alf! And he's got a mission... get to Mars to visit his friends Rhonda and Skip. The problem is, his space ship is broken. And the Alfer is not about to grow wings. So it has to be fixed... and that's where you come in! Guide Alf as he searches for the things needed to fix his ship. Pearls snatched from the jaws of giant clams, space scooter fuel in the darkest caves, spacesuits, costumes and more! Succeed, and you'll send the Alfer on his way to a happy reunion. Mess up, and the Alfer stays stuck on Earth. Do you think you can do it? "NO PROBLEM!" 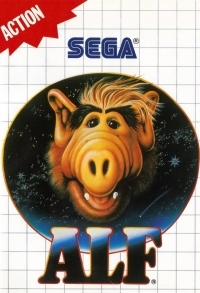 This is a list of VGCollect users who have Alf in their Collection. This is a list of VGCollect users who have Alf in their Sell List. This is a list of VGCollect users who have Alf in their Wish List.